The Polycom SoundPoint IP 560 desktop phone, with GigE and Polycom HD Voice capabilities, is designed to make voice communications effective and productive. Communication may be the greatest tool in any business.To facilitate clear verbal communications, you need desktop phones with crystal-clear voice transmission. The Polycom SoundPoint IP 560 is a four-line GigE SIP phone that delivers calls of unprecedented richness and clarity. It also supports a comprehensive range of cutting-edge features. The Dynamic Resource provides quality refurbished Polycom IP 560 SoundPoint - Refurbished Polycom at an affordable price. All Polycom IP 560 SoundPoint - Refurbished Polycom are refurbished Polycom that will be delivered to you in like new condition. 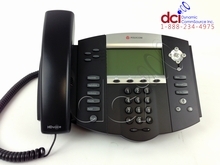 Call today about quantity discounts available for refurbished Polycom IP 560 SoundPoint - Refurbished Polycom. The Dynamic Resource is always striving to provide the best quality used business phone equipment at the most competitive prices. Our Refurbished Polycom IP 560 SoundPoint - Refurbished Polycom have been restored to an almost new quality and priced to be the most competitive on the web. If you find a better price on Polycom IP 560 SoundPoint - Refurbished Polycom give us a call and we’ll beat it! 1-888-234-4975 (Toll Free).